Australia Day is a day to reflect on our journey: acknowledge our past, rejoice in the present and look confidently to the future. It is also an opportunity to acknowledge and celebrate the contribution of individuals and organisations that have made a noteworthy contribution to our community. 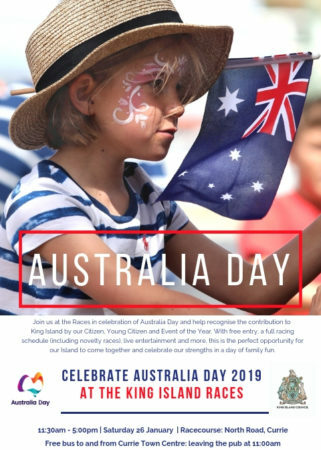 Join us at the Races in celebration of Australia Day and help recognise the contribution to King Island by our Citizen, Young Citizen and Event of the Year. With free entry, a full racing schedule (including novelty races), live entertainment and more, this is the perfect opportunity for our Island to come together and celebrate our strengths in a day of family fun.